Did you know Artists For Humanity recently expanded their EpiCenter? This Wednesday, January 30 from 5 pm - 7 pm, Artists For Humanity invites you to their first Open Studios of 2019. Tour bustling studios, meet inspiring teens, preview the latest projects, network with local creatives, and mingle over wine and cheese. The event is free, family-friendly, and open to the public. Artist For Humanity is located at 100 West 2nd Street next to the A Street Park and just blocks away from the Broadway red line T station. The same evening (January 30), the Boston Society of Architects (BSA) is hosting an opening reception of Surface Tension: Architectural photographs from Peter Vanderwarker and Boston Up: Infrared photographs by Neal Rantoul from 6 pm - 8 pm in the BSA Space at 290 Congress Street. R.S.V.P. for this free event. On view through June 1, 2019. Start February with the Fort Point Arts Community (FPAC) opening reception of Melt , a reinterpretation of Nordic myths — with feminist and science fiction twists through video, photography and sculpture by artists Isabel Beavers and Laine Rettmer. The artists created Melt during a residency in Iceland. The opening reception is Friday, February 1st from 6 pm - 8 pm at FPAC Gallery, 300 Summer Street. More details. 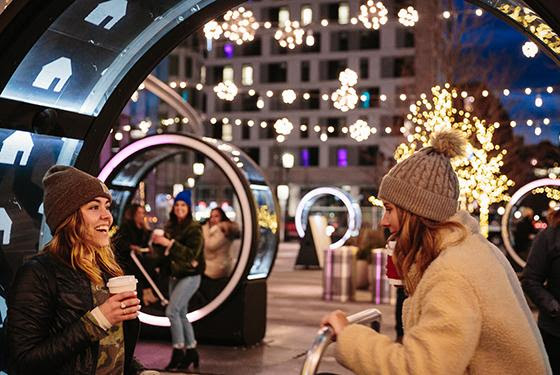 The Loop, an interactive art experience, has landed at One Seaport Square (between Showcase Icon and Scorpian). Take a seat in these giant circular structures, pump the handlebar, and watch a story unfold. The installation will be around until February 17, 2019. More details. 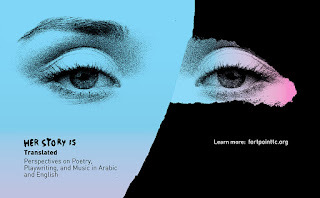 On Sunday, February 10th at 2 pm, the Fort Point Theatre Channel presents Her Story Is Translated: Perspectives on Poetry, Playwriting, and Music in Arabic and English coordinated by Jennifer Jean and Amy Merrill. Her Story Is continues with this special event highlighting the process of “translation” in the poetry, plays, and music between and among several artists living in Iraq and in the United States. The free event will take place in Art Under The Stairs at Midway Artist Studios located at 15 Channel Center Street. To learn more about Her Story Is visit the Fort Point Theatre Channel.